The holidays are here! It’s time for parties and fun family gatherings. You know what that means, right? Food, and lots of it! For many people that means overindulging, and regretting it the next day. One good way to avoid overeating is to skip the huge meals and serve smaller portioned appetizers at your parties. That way, you can eat tiny amounts of a few different foods without feeling like you’re depriving yourself of the fun holiday eating experience. Plus, it’s easier to appease everyone when you offer a variety. 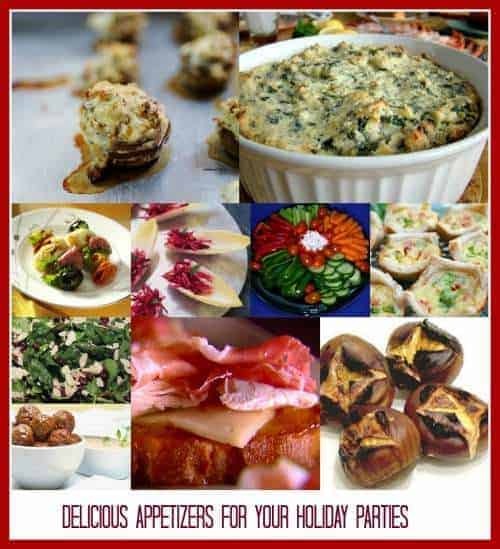 Enjoy this roundup of delicious appetizers for holiday parties. 1. Stuffed Mushrooms– These are not only relatively easy to make, they’re pretty good for you too. Mushrooms are low in calories and high in selenium, Vitamin D, and other minerals. 2. Spinach Artichoke Dip– In about the same time it takes you to catch up on your favorite sitcom, you can make a delicious and nutritious dip that is sure to be a hit at your next holiday party. Serve it with pita bread, sliced baguette, or tortilla chips. 3. Antipasto Kabobs – Kabobs make great appetizers for your holiday party because they’re so flexible. These antipasto kebobs are both delicious and colorful! Substitute the plain cheese tortellini for spinach tortellini to add a little festive color. 4. Endive Boats with Marinated Vegetables– Just about everything looks great in “boat” form, and these endive boats are no exception! Use red and green vegetables to make it look like Christmas! 5. Vegetable Platter – Green celery, red tomatoes, and orange carrots make for a colorful and festive holiday appetizer. 6. Red and Green Quiche Bites– Just about everyone loves miniature quiches, and you can create a variety of different flavors for your guests. Stuff them with red and green peppers for the veggie fans, ham for the meat lovers, and plain cheese for those who don’t quite live on the wild side when it comes to appetizers. 7. Spinach Salad with Cranberries– Another delicious take on spinach, this recipe features that main staple of holiday appetizers: cranberries! There are very fruits that are more festive than these healthy red berries. 8. Apricot and Chicken Bruschetta– This new take on the classic bruschetta recipe is sure to have guests talking about your delicious appetizers for weeks after the party! Apricot and chicken make an amazingly delightful combination! 9. Saucy Meatballs with Creamy Dipping Sauce – A little something for the meat eaters, and super easy to make! This recipe requires just four ingredients for both parts! 10. Roasted Chestnuts – No list of appetizers for your holiday parties could be complete without roasted chestnuts! Even if you can’t roast them over an open fire, you can still create this delicious appetizer for your guests to enjoy. I like these recipes especially the Meatballs with dipping sauce. Must try these. Yum! Spinach Artichoke Dip is my fav! Thanks for a great list so I don’t have to search out recipes for parties this year! Lots of great ideas. My favorite is the kabobs. Oh my, I am off to pin some of these, they look amazing. Thank you!